With so many agencies and freelancers around how do you make sure that you choose to work with the one that’s the right fit for your business? The growth in digital over the past year has been mammoth and it’s more important than ever to invest in a digital strategy and an online presence to keep up with the trends. 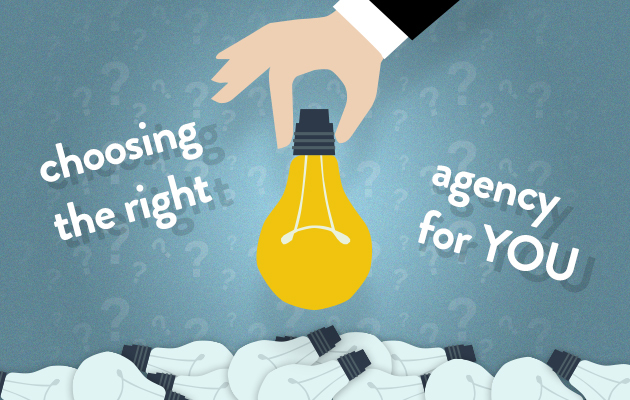 Selecting the right agency early on can make a big difference to your experience and success rate. Making the wrong decision can be costly and waste a great deal of your time, and in the long term even damage your business’ reputation. You’ll want to ensure that your customer has the best experience possible, be that on your website or using your app, and you’ll be relying heavily on your agency of choice to help you achieve that. Now, you just need to find them. Personal recommendations can be a great place to start when looking for a digital agency. You can ask some of your questions and get the inside scoop off your connection before you even meet with them. This is especially useful if you speak to someone within your industry as then you’ll know that the staff at the agency are familiar with your sector. If you know they’ve completed work to a high standard before, then chances are they’ll do that again. Take a good look at examples of past work. This follows on nicely from the previous point. If you’ve seen examples of their work and like what they do, then that’s half the battle. Of course it doesn’t always necessarily follow that if they’ve worked well on one website that they can do it all. Each project is totally different and there are many factors involved, but if you’ve seen plenty of great examples of their work then you know they’re capable and there’s a high chance that they’ll be able to continue to produce work of this calibre. How easy do you find it to communicate with them? Sometimes, through no fault of either party, there isn’t an easy connection. If you’re not finding it easy to communicate what you want to an agency, and you don’t feel comfortable that they understand you then you might have to look elsewhere. In any industry you’re always going to occasionally come across people that you struggle to communicate with but, on the flip side, you may well find someone that is completely on your wavelength and the ideas flow easily. Those are the people who will be able to do their best work for, and with, you because they’ll better understand you, your business and what you’re trying to achieve. Are they asking you a lot of questions? This is a good thing! The discovery process is arguably one of the most important parts of the project. It’s certainly not something that should be taken lightly. Questions asked before work actually begins, and then over the course of the project, will save you time and money in the long run. If an agency is keen to learn about your business, your competitors, your clients and your goals they will be much better positioned to give you the website that will best suit your business. Do they build responsive sites? You shouldn’t really even have to ask if your site is going to be responsive any more. It’s pretty much a basic requirement and should be part of the solution from the outset. So many more people browse on their phones now and you don’t want to lose out because your clients and customers can’t use your site properly on their device. We wouldn’t build a site that wasn’t responsive now and you shouldn’t accept anything less. It’s worth considering the size of the team you want to work with. Do you want to go with a lone freelance designer or developer, or an agency with a specialist department for each phase and the bonus of a project manager to ensure the smooth running of your project through the studio, or a bigger company with hundreds of employees and multiple locations. If there is a project manager or main point of contact then gauge whether or not they’ll be proactive in contacting you and reminding you about things. You’ll want someone in your corner, driving things forward as this means it’s one less thing for you to do. Your aim is to find a team you can trust and can develop a long term relationship with so that, in theory, you’ll never have to hunt for another agency again. We always aim to build a solid relationship with each of our clients at the beginning of the first project in the hope that we can help your business grow, and continue to do great work with you in the future. If you’d like to have a chat about the possibility of working with us please get in touch.